Two Henry Hammond bowls - 4" (101 mm) diameter, 2¾" (69 mm) high. Henry Hammond, born 1914, studied for five years at the Croydon School of Art and at the age of twenty won a scholarship to the Royal College of Art where he was taught by, among others, William Staite Murray. In 1939 he was offered the post of Pottery Instructor at the West Surrey College of Art, but was unable to accept it as he had to serve his country in the second world war. On his return from war service he spent some time with Bernard Leach at St Ives and then went back to Surrey to take up the position at the West Surrey College of Art where he continued until his retirement in 1980. 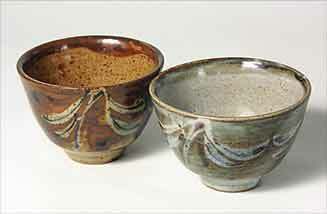 During the post war years he had a studio in Hampshire which he shared with Paul Barron until Paul's death in 1983. Together they helped build up the ceramics department at Farnham School of Art. Henry was awarded the MBE in 1980, six years before his death. He is best known for his brush decorated stoneware, but also worked in porcelain and in his early days as a potter, exclusively slipware.